I first made the adorable Parfait dress from Colette Patterns in a pink check. After I figured out how to do a small bust adjustment for this pattern, I knew I'd have to make another version of it. 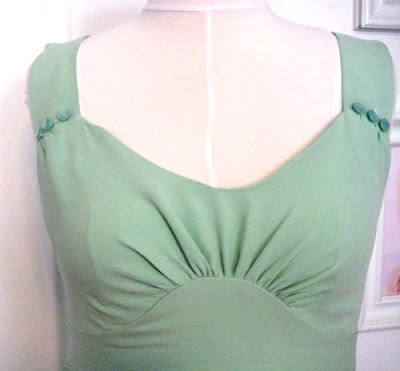 Besides the sba (which you can see in this tutorial), I also made one other alteration: I omitted the tab closure on the straps, and sewed three little decorative buttons on each. This is an easy change, and I think it makes the dress just a little fancier. I'm really happy with this version! The fit is so much better for me. I think the silk also makes it very glam, and a solid color really emphasizes the lovely lines of this pattern, especially the curved midriff. I love how this design can be either casual in cotton or dressy in a more fluid fabric. I think if you removed the pockets and made skinnier straps, this could be an awesome cocktail dress in charmeuse. Oh, and I also used silk organza in place of regular fusible interfacing. The midriff section of this pattern is meant to be interfaced, and I noticed in my pink check version that on hot days, this feels a little clammy. I read in a Threads article that for summer clothing it's a good idea to use a natural fiber in place of interfacing since it breathes, unlike the fusible stuff. The organza was easy to use--I just cut it out like interfacing and then basted it to each corresponding piece of the fashion fabric. I think this will be a good summertime substitution! Please note that I've made a couple updates to the sba tutorial. I forgot to add instructions for altering the adjoining pattern pieces. Not hard to do, but important. So make sure you check it out if you'd like to try this alteration! Even if you don't usually do an sba (and I don't, actually), I'd really recommend it for this pattern line if you're smaller than a C cup. Also, I'm very excited that Sarai of Colette Patterns has agreed to do an interview with me. So check back for that soon! It is gorgeous! I love seeing this dress in a solid because the lines are just so beautiful. And I love your change to the straps, fits this dress perfectly. Really fabulous in that beautiful green! Interesting how it alters the 'tone' of the dress (but I do love both versions). I've ordered the pattern already but the postage to the UK is taking a frustratingly long time! Blame that on where I live! What do you mean...you have a great eye for detail!! Love, love the buttons on the straps. This pattern along with the Eclair has been sitting by my sewing machine for weeks now. I need to get on it! The fabric ideas are endless so I can't decide. Love the washed silk idea and the silk organza is a great alternative! You are one productive lady--love it! I forgot to mention--my recent dress was totally inspired by your adorable green and white polka dot sundress! I had to have it,. but the pattern came in such small bust size so I went the modern design route. That dress is beautiful and is very flattering on you!! I am eagerly awaiting delivery of these patterns, and I think the Parfait will be first to be made up ... But no sba for me! This is such a beautiful version! This is absolutely darling! The color, the fit... lovely. Gorgeous! That color is beautiful, and the button detail is just wonderful. Love love love it! The button detail is my favorite- I am definitely incorporating that! Another wonderful dress to admire. I love the button detail on the straps. I forgot to add...I'm totally intimidated by your genius SBA but I would definitely need one for a Colette pattern. Thanks everyone! Isn't it funny how you can get so much variation from fabric choices? My husband couldn't believe that this one and my pink check parfait came from the same pattern! That's what makes it all so fun I think. Knitosaurus, don't be intimidated by the sba! Just think of it as tucking out the extra fabric, and then transferring those tucks to the pattern. That's really all there is to it! What a fabulous dress- well done!! It looks great. I've not come across Colette Patterns before, and I may have to look in to them more as I am opening an online sewing boutique in the UK. It's a really pretty design. It looks great. I prefer your smaller buttons in lieu of the original design. I think a fancier version; in the charmuse, would benefit from omitting the pockets as well. I would love to make a winter version of this dress in a wool crepe or gabardine, and wear a simple cap sleeve blouse (perhaps with a touch of lace) underneath. GORGEOUS! I was shopping my fabric stash and I was trying to decide between some dark green and some pale green linen that I've had for a while, and after seeing yours I'm going to do it up in the pale green now. Thanks so much! Keep up the lovely work. Cotton organdy is also a great substitute for fusible interfacing when you are using cotton fabrics and for warm weather clothing. Don't waste money buying pricey Italian Organdy or other heirloom type organdies - those can be up to $50 a yard. Just opt for your garden variety 100% cotton organdy - maybe $5 or 6 per yard - not sure I haven't had to buy it in years. Organza is what you find in silk, poly and other fibers but when it's cotton it's called organdy. I bought a huge bolt years ago (I had to order 20 meters to get the store to bring it in, so I bought the whole thing myself) It softens when wet or crushed but as soon as you iron it, it becomes crisp and firm again. p.s. if you can't find any, I'll see if I can locate my bolt and I'll send you some so you know what to look for. I made this dress too in a charmuse, and it turned out great! I actually dropped the hem to the floor so it's more of a maxi dress. I love it and can't wait for the fall line!